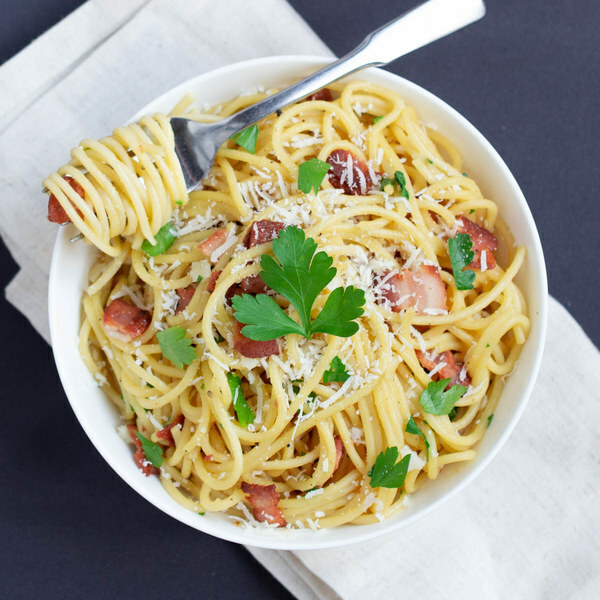 ← Garlicky Spaghetti Parmesan Carbonara. While pasta is cooking, preheat a skillet over medium-high heat. Chop the bacon into 1-inch pieces; add to the skillet and cook until crispy, 4-5 minutes. Once done, transfer to a plate lined with paper towels. Reserve 2 tbsp of bacon fat. Meanwhile, crack the eggs into a medium bowl; add 3 tbsp cream and whisk to combine. Finely grate Parmesan and transfer to the bowl with egg mixture. Season with salt and pepper; whisk to combine. When pasta is done, drain in a colander, reserving ½ cup of cooking liquid. Trim off and discard the root ends of the garlic; peel and mince or press the garlic. Add the reserved bacon fat to empty pasta pot. Return pot to heat, reduce heat to low. Add garlic, stirring until fragrant, about 1-2 minutes. Return pasta and bacon to pot. Remove pot from heat, add the egg mixture to pasta, stirring frequently. Stir just until the egg mixture begins to thicken, 3-4 minutes. If the sauce seems dry, add some of the reserved pasta water 1 tbsp at a time, until rich and creamy. Wash and dry parsley. Shave leaves off the stems; discard the stems and mince the leaves. Reserve a small amount for garnish and add the rest to the pot with the pasta. To serve, divide pasta between bowls and garnish with remaining parsley. Enjoy!